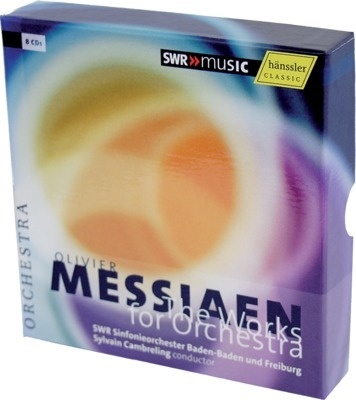 On the occasion of 100th birthday of Olivier Messiaen, the Sinfonieorchester Baden-Baden und Freiburg des SWR have prepared a sumptuous 8-CD-Box set. It is the first time that Messiaen's complex orchestral scores have been performed by a single orchestra and a single conductor. This results in a uniform interpretation, which in this case is characterized by orchestra renown for its sensitive and insightful interpretations of the newest scores and a conductor who has been devoted to the cause of Messiaen's music. 4.1 Et exspecto resurrectionem mortuorum I. Out of the depths have I cried unto thee, O Lord. Lord, hear my vioce. 4.2 Et exspecto resurrectionem mortuorum II. Christ being raise from the dead dieth no more; death hath no more dominion over him. 4.3 Et exspecto resurrectionem mortuorum III. The hour is coming, and now is, when the dead shall hear the voice of the Son of God. 4.4 Et exspecto resurrectionem mortuorum IV. They shall be raised in power, with a new name - when the morning stars sing together and all the sons of God shout for joy.